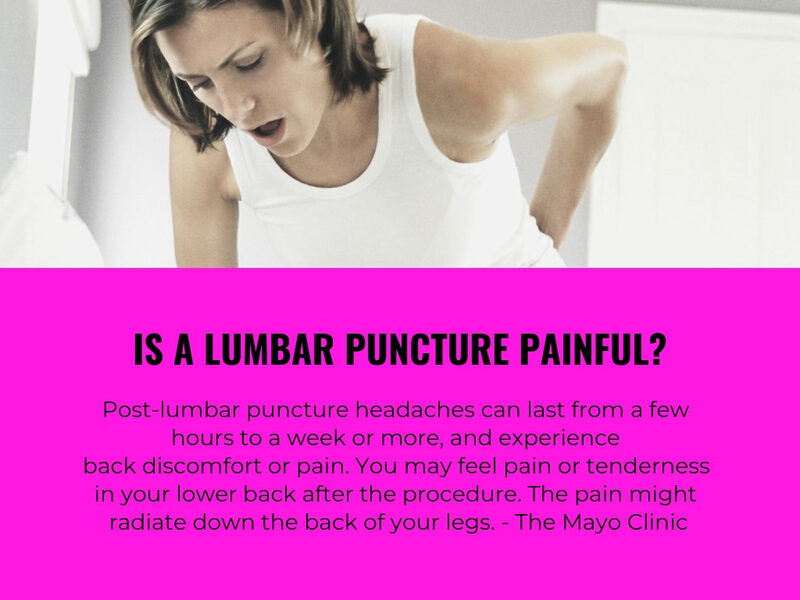 What is a lumbar puncture & does it hurt? 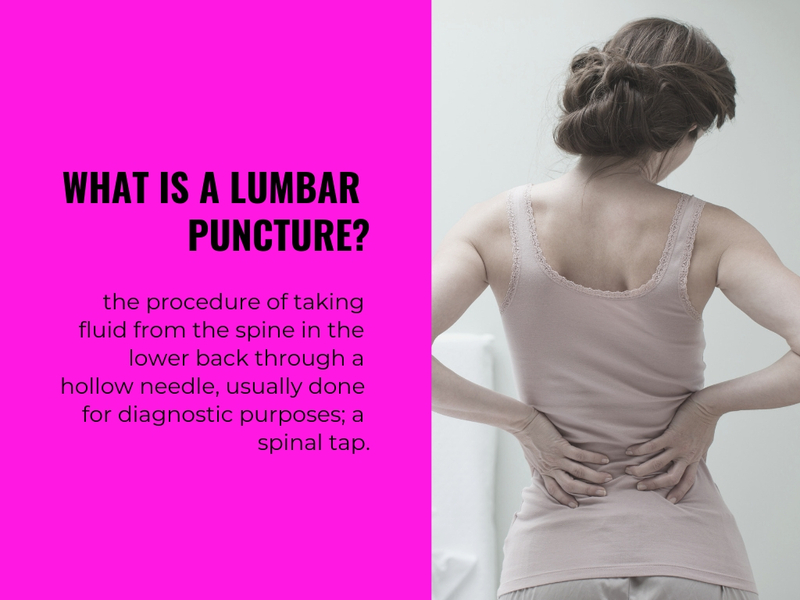 Find out more about the exact science of the lumbar puncture and why and how it is done. Two days after the procedure, I had trouble walking around my house, and had to brace myself more than once on my kitchen island in order to stand up. My ability to ambulate began to worsen, as did the spasms and movie-actor-like hyperbole-seize-ups that ripped through my back. I couldn’t sleep at night and was sweating profusely. It was the kind of all-encompassing pain where light and hope DO NOT come to play. I was scared by the pain’s power and by its darkness. I cried A LOT — out of discomfort, in fear, and in frustration. I wasn’t able to get back into the everyday pace of my life. I watched my daughters and my husband parade through my bedroom, sharing the news of their days, and fetching me more water. I loved talking with them, and felt sad that I couldn’t move. Hugs were gingerly given and timid. I could see the worry on their faces. 72-hours passed and the pain wasn’t getting any better. I called my primary care doctor and we made a plan for me to get out the door and straight to the emergency room. The ER doctor explained that the first step in alleviating the massive post-lumbar puncture pain was to lay flat (again) and get a high dose of liquid caffeine, the likes of which are joked about on social media “It’s Monday-again-hook-me-up-to-a coffee-drip” memes. I made an attempt at humor that I was about to become a cliched “Cathy” comic: a hysterical reflection of a frazzled highly-caffeinated working woman. The joke fell flat. My ER doctor was too young to have read the “Cathy” comic, or to have appreciated its crappy, outdated stereotypes of womanhood. I looked at my husband and he smiled. Thank-the-maker I was still funny, even when I was in pain. I have been in the supine position a lot lately – lying face up and as flat as possible to help ease the nerve pain in my neck, spine, and hips. I have become intimately familiar with the outline of my bedroom’s skylights; the cobwebs in the corner of the cathedral ceiling; the piled-up-dust on the ceiling fan. In this state, my mind has wandered from the need to get a cleaning person to help with the everyday jobs that have rapidly piled up, to worry about what my finances will look like if I have to change how much I work; to how I will be able to TRULY contribute to my family’s life. I closed my eyes in that ER room, and started to reflect on the same things that have plagued my mind for weeks. Lying flat and doing very little has been the breeding ground for a deep-level of anxiety about participation, about a quality life, and what I could create in my future. I am more than tired of feeling sad and worried.I have started to loathe movies and scrolling through my phone. I need more than a good new book to read. Before my diagnosis, I felt like I had hit a massively productive stride – one where both fiscal and personal remuneration were at a peak. That level of work has come to a screeching halt, as the pace I was keeping was untenable. As the caffeine drip kicked in, and I found myself nodding off and drowsy – the exact opposite of the jacked up person I thought I would be. My mind quieted a bit, and I thought of something that was shared with me the day after I received my diagnosis of MS: “Kristin – It takes about a year for you to understand what you can do and what you can’t. And even after that, it will probably change again.” I lay there and I prayed for grace to help me manage through these changes, and I prayed for an affordable cleaning service so that I didn’t have to continue to look at the dust piles on the ceiling fan. 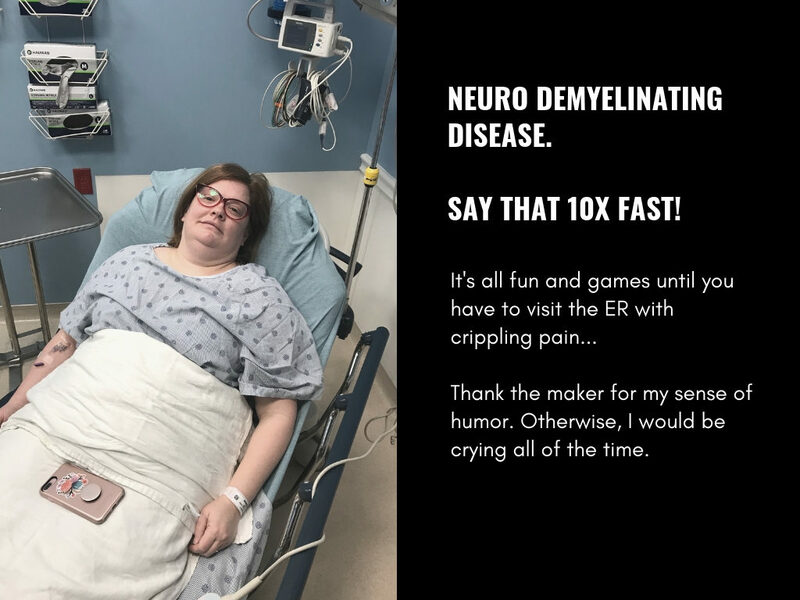 As always, I write to help make sense of the swirling intensity and flood of thoughts in my head, as someone who is living with neuro demyelinating disease. I have found that writing and sharing my thoughts and feelings about chronic illness is extremely therapeutic. My hope is that it will resonate with you, or with someone you love who may be experiencing something similar. I have found that one of the MOST important parts of living with this diagnosis is feeling heard and feeling understood. If you are experiencing your own medical or psychological emergency, I highly recommend speaking with your care team and loved ones, and/or calling 911 within the US. These personal reflections, links, and references here are not meant to be diagnostic, definitive, nor final. They are NOT a replacement for professional help and support. Do you have your own stories to share? I would love to hear them. Humor helps me a lot. I would love to hear what helps you in the face of a health diagnosis.